On 19 Dec, the US Federal Reserve has again raised the target range of its benchmark interest rate by another 25 basis points with 2.5% at the high end. The move also marked the fourth rate increase of the year by the US central bank. The projection on the number of rate hike in 2019 has also been trimmed to two, signalling a more cautious outlook for the following year. Politically, the recent partial shutdown of the US federal government has also contributed to the uncertainty mood due to a dispute over the funding for the Mexico-United States border wall that left lawmakers in a stalemate. Following the landmark Trump-Xi meeting in Buenos Aires in December, the two countries have declared a 90-days trade truce, providing a temporary reprieve amid trade and economic jitters. Despite so, the much anticipated Santa Rally has remained largely elusive this year. Back to the local bourse, the STI has generally been on a declining trend from its closing of 3255.46 at the beginning of October to 3068.76 at the end of the year. For the last quarter, the STI has recorded a drop of 5.73%. Overall, the STI has fallen a total of 10.54% in 2018, a stark contrast to its 17.38% surge in 2017. Similarly, the SGX S-REIT 20 Index has also been inching lower from 1235.117 in October to 1208.714 in December, a decline of 2.14% for the quarter. In the mid of October, I have initiated a position in CapitaRetail China Trust in view of a dynamic new world of retailing led by rising momentum of the "New Retail" concept in China. Towards the end of the month, I have bought into Far East HTrust, riding on the exciting prospect of the local hospitality industry, following from a combination of controlled hotel supply and strong tourist arrivals. Recently in December, I have also subscribed to the rights issue by Cromwell E-Reit and was surprised to be allocated almost all of the excess rights that I have applied for. 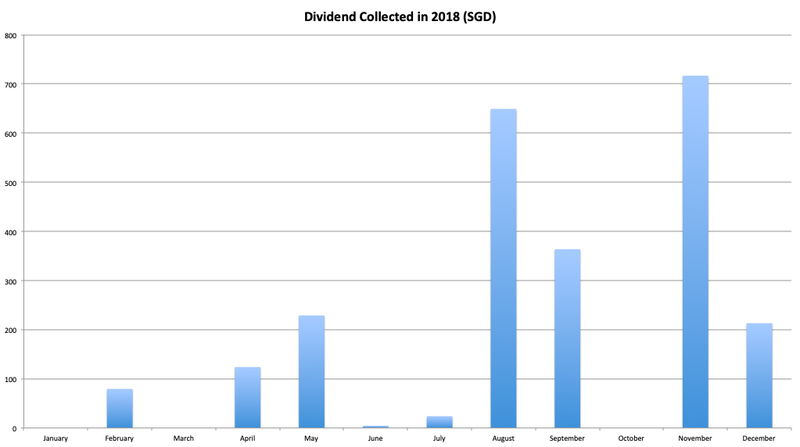 Apart from shares, I have also ploughed a small sum into the Dec 2018 and Jan 2019 issues of the Singapore Savings Bond given the rising short-term interest rate. The Jan 2019 issue will be replacing that of May 2018 as I have redeemed the latter this month. In order to differentiate the capital appreciation and injection of the portfolio, I have used a different colour - green to represent the amount of funds which I have contributed to the portfolio in a given month. This would provide a clearer picture on any rise in portfolio value. 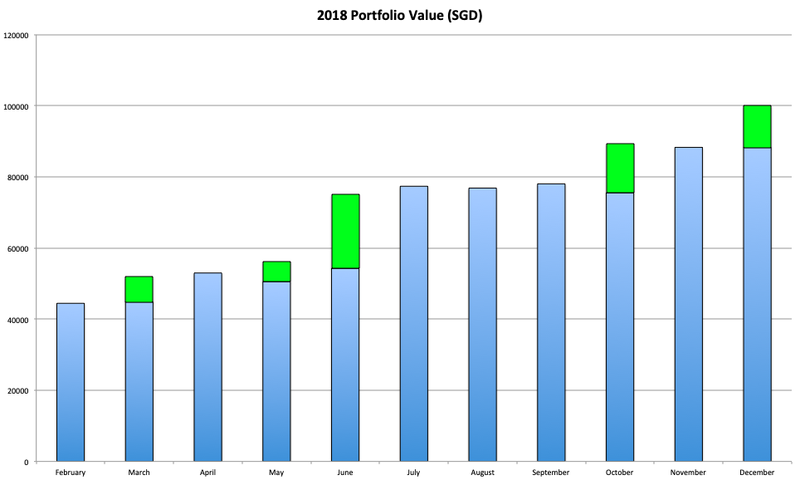 The portfolio value has finally breached the $100,000 mark in Dec, largely attributed to consistent injection of capital throughout the year. Given the sizable value, I should be looking to improve on my portfolio allocation, as well as to review and consolidate some of the holdings in the following year. The 4th quarter has recorded a total amount of dividend collected at $930.17 with November seeing the highest collection of the year. The total dividend derived from the portfolio might be relatively insignificant as compared to the portfolio value as majority of it comes from fund injection this year. Hopefully, I am able to see a jump in the passive income in the following year. To wind up the last post of the year, thank you for reading and a happy new year to everyone! May this new year bring new happiness, targets and accomplishments. 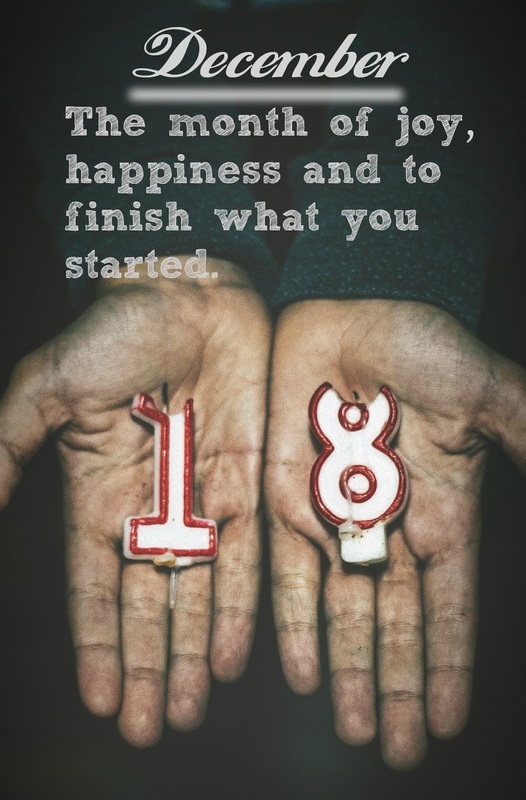 Tomorrow is the first blank page of a 365-pages book. Write a good one! Citibank has officially announced that there will be revision made to the Citi MaxiGain Account from 2 Jan 2019, finally putting the rumour on upcoming changes to rest. Launched in Feb 2016, this will be the first time that Citibank will be revising the terms for this passive savings account. This article aims to provide an overview of the upcoming changes and whether the existing account holders stand to benefit from the revision. You may also wish to refer to the revised Terms & Conditions and FAQ for more information. Before examining the upcoming revision to the Citi MaxiGain Account, it is probably beneficial to have a good understanding and recap of its current interest rate mechanism. For ease of reference, I will briefly summarize on how an account holder can earn interest with this unique savings account. Base Interest Rate: Equivalent to 80% of the 1-month Singapore Dollar Interbank Offer Rate ("SIBOR"). It fluctuates daily in accordance to the movement of the aforementioned rate. You can find out more about the latest SIBOR on the ABS website. In order to earn the base interest rate, a daily end-of-day balance of at least $10,000 is required to be maintained in the account. The maximum account balance that earns the base interest rate is capped at the first $150,000. Bonus Interest Rate: It operates via a counter mechanism which will increase the bonus interest rate by 0.1% along with each step up to a maximum of 1.2%. The counter starts at 0 and will raise by 1 each month provided that the lowest balance in a month is equal to or greater than the lowest balance in the previous month. At the end of the month, the account holder will receive the e-statement for the Citi MaxiGain Account which indicates the current counter accumulated. There is no minimum or maximum balance requirement to earn the bonus interest rate as long as the aforementioned criterion is fulfilled. Therefore, the total interest rate an account holder can expect to earn on the Citi MaxiGain Account is the sum of the base interest rate and bonus interest rate. For further insight, you may wish to refer to my previous post here. In addition, it is prudent to take note of the onerous prerequisite imposed on Citibank products to maintain at least $15,000 to fulfill the minimum total relationship balance ("TRB"). Should the TRB falls below the stipulated amount, an account service fee of $15 will be charged. The base interest rate will be revised to 70% of the 1-month SIBOR. This is definitely an undesirable change with a 10% decline in the benchmark pegged to the 1-month SIBOR which forms the main component for the base interest rate. As of 8 December 2018, the 1-month SIBOR as reflected on the ABS website is 1.64125%. To put it into perspective, a 10% decline in the benchmark equates to a 0.16% decrease in the base interest rate. This margin tends to widen along with the rise in SIBOR. Since the start of the year, the SIBOR has been picking up gradually from 1.33% to the current 1.64%. From Citibank's stance, it may be conceivable to take measures in order to tackle the creeping SIBOR. In order to earn the base interest, a daily end-of-day balance of at least $70,000 must be maintained. This is yet another unappealing change to the savings account. The barrier to earn base interest would be raised by a whopping 600% to $70,000! Such significant jump would definitely catch many account holders (including myself) off guard. In my opinion, this is probably the most distasteful modification among the three. Given the rise in SIBOR, the base interest rate has the potential to go higher and therefore carries a heavier weightage of the total interest rate. However, it would definitely be challenging for an average account holder to put in another $55,000 on top of the TRB before he can ride on the upturn in SIBOR. Bonus Interest Rate will be capped at $150,000 balance. Even though limiting the maximum balance amount that earns the bonus interest is viewed as an unpleasant alteration, the adverse impact is likely to be less pronounced as compared to the 2 other areas of revision as highlighted above. To clarify, there is no minimum balance requirement to earn bonus interest. Taking the Crazy Rich Asians out of the equation, it is probably safe to consider the amassing of $150,000 savings an arduous task. Furthermore, with the availability of alternate instruments offering attractive rate, earning a maximum interest rate of 1.25% (in the context of current mechanism) for balance beyond $150,000 is definitely not putting money to work hard enough for you. As such, I am rather indifferent to this area of change. Meh. The table summarizes the 3 areas of alteration made to the savings account. All in all, it is apparent that all three changes are unwelcome and would be detrimental to the interests of the account holders. Taking the 1-month SIBOR to be 1.64125%, the revised base interest rate is calculated to be approximately 1.15%. The bonus interest rate can stretch from 0% (Month 1) to 1.2% (Month 13). Altogether, the total interest rate falls within the range of 1.15% to 2.35%, assuming that the minimum daily balance of $70,000 balance is maintained in the account and that the SIBOR remains constant throughout the 13 months. At maximum counter, the base interest can take up quite a considerable portion (48.9%) of the total interest. However, the barrier to earn it has raised significantly, making it almost out of reach for the average account holders who do not have $70,000 balance in their accounts. Alternatively, new account holders may consider depositing the TRB of $15,000 to raise the counter. The remaining $55,000 can be topped up at a later stage when the bonus interest derived from the counter becomes sufficiently significant. Even though he may lose out on the base interest during those months, I would suppose that this would be a better allocation of funds as the total interest rate would be relatively unattractive during the process of building up the counter. Previously, we have established that the SIBOR moves in tandem with the US Fed Fund Rate. After staying depressed since 2009, both rates have begun to pick up from 2015 onward. The Fed has recently pointed toward the strong likelihood of another quarter-point adjustment in the central bank's benchmark rate target in Dec and the FOMC is likely to approve three more hikes in 2019. In the near term, I would expect the SIBOR to rise further. Even though there is certain restriction imposed when it comes to the withdrawal of funds from Citi MaxiGain Account, an account holder can still draw out the interest credited without resetting the counter. This is because the bonus interest is awarded via a counter system that is based on the lowest balance in a month. For example, an account holder has amassed a balance of $150,000 at the start of the month and has decided to withdraw the excess interest which earns a paltry 0.05% interest rate. At the end of the month, the base and bonus interest is credited to the account but the lowest balance of the month remains at $150,000. The account holder then withdraws the interest at the start of the following month, leaving the balance of $150,000 untouched. As the lowest balance in Month 1 is equal to the lowest balance in Month 2, the Counter will raise by 1. If the Counter has already reached the maximum count, it will not reset. Assuming that the SIBOR remains constant throughout the 13 months, the Citi MaxiGain Account can reach up to an effective interest rate of 2.35% at its full potential. This is almost thrice that of its passive savings account peer, CIMB FastSaver Account (0.886%) at the second placing. Even if you are not inclined to maintain $70,000 and would prefer to earn simply the bonus interest, the Citi MaxiGain Account still continues to outshine its passive peers easily with an interest rate of 1.2% (after Month 13). However, Citi MaxiGain Account has certain drawbacks which are mainly attributed to the imposition of withdrawal restriction and high TRB barrier. Additionally, it would take at least a year to reach Counter 12. Even if we were to place Citi MaxiGain Account in a different league, the high interest rate it provides at its full potential is still startlingly comparable to that of the other active savings accounts, despite of the upcoming revision to its base interest rate. Maybank SaveUp Account still offers the best bang for the buck at 3% effective interest rate, with a rather taxing requirement of at least $300 GIRO payment or the qualification of any of the other 6 products/services. UOB One Account still retains the runner-up position at 2.44%. Contending for the bronze medal are Citi MaxiGain Account (2.35%) and OCBC 360 Account (2.30%). That is to say, if an account holder has an idling sum of $70,000 and wishes to perform neither salary crediting nor credit card spending, he may choose to deposit it in Citi MaxiGain Account and earn higher interest than if he were to place in OCBC 360 Account. Running the risk of having an over-simplistic comparison, I have picked a few other conservative financial products to have a general idea of the yields across various instruments. To realise the potential of Citi MaxiGain Account, the timeline is assumed to fast forward to 13 months onward while the yields of other instruments are presumed to remain constant. Singapore Savings Bonds: Using the data from the Jan 19 issue, the interest rate for Year 2 is reflected as 2.14%. The minimum investment amount is $500 for each issue. Fixed Deposit: One of the fixed deposits that currently offers the highest interest rate is by CIMB Bank. Its promotional rate of 1.9% p.a. on a 12-months SGD Time Deposit comes with a minimum placement of $10,000. ABF Singapore Bond Index Fund: The ETF invests in the constituents of the iBoxx ABF Singapore Bond Index which tracks a basket of high-quality bonds issued primarily by the Singapore government and quasi-Singapore government entities. Based on its declared 2018 dividend of $0.0261 and the recent price of $1.143 (as of 8 Dec), the dividend yield is approximately 2.28%. Kindly note that this is excluding any capital gain/loss due to price movement on the bourse. Graphically, the Citi MaxiGain Account tops the chart with the potential interest rate of 2.35%. Following closely, the dividend yield of 2.28% offered by ABF Singapore Bond Index Fund is relatively attractive as well. However, it is vital to note that the returns on the passive savings account and ETF may be subjected to fluctuation in the SIBOR and market pricing respectively. In Year 2, the Singapore Savings Bonds offers an interest rate of 2.14% which lagged behind that of the other 2 products. Relying on the information from Jan 19 issue, the average interest rate per year will reach 2.37% in Year 8 due to the employment of step-up mechanism for its coupon rates. Despite the revision to its base interest rate, it appears that the total interest rate potentially offered by Citi MaxiGain Account is still relatively competitive. 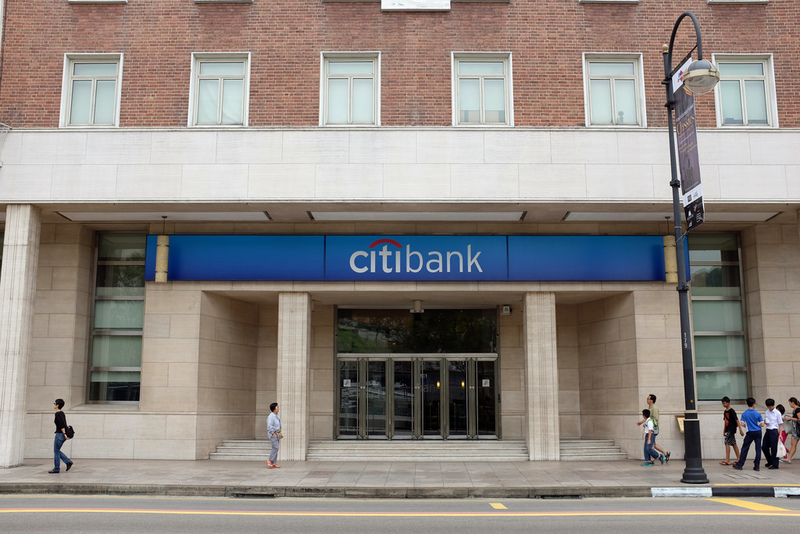 However, in the recent period when many financial institutions are dangling higher interest rate and vying for funds before the interest rates rise further, Citibank may be treading on thin ice with its decision to revise the terms of Citi MaxiGain Account. Whilst the reduction in the benchmark pegged to the 1-month SIBOR, coupled with more demanding hurdle to earn interest might help the bank to lock up substantial funds, this strategy can be risky and might backfire, especially with the increasing payout offered by alternate instruments which does not impose a significant minimum balance requirement. Having said that, I am currently on Counter 7 and will likely hang on to the account for the time being given SIBOR upward trend in the near term. In the meantime, I am keeping my options open. If there has not been any user-initiated transactions (e.g. withdrawal, deposit) for the past 6 months, Citibank will render the account inactive. Once the account is classified so, the account holder is unable to carry out transactions on the account. The base and bonus interest should still be credited to the inactive account. To reactivate the account, the account holder can call the hotline and reach out to the customer service officers for assistance.